The fantastical magicians of Sparkplug Comic Books have found some spare copies of one of my favorite mini-comics, DOODLE DAZE! YAY! Head over to their online store to get it as well as many great books they publish and distribute. UNICORN MOUNTAIN #3 is out now! And they are celebrating it with a PARTY PARTY at the Warhol Museum! Everyone should travel to Pittsburgh and come to this event! It sounds like it's going to be so awesome and plus Warhol Museum, duh!!! 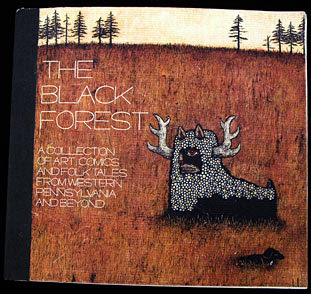 The Black Forest: A Collection of Art, Comics and Folk Tales from Western Pennsylvania and Beyond includes exciting contributions from Theo Ellsworth, Kathleen Lolley, Ben Kehoe, Bill Wehmann, Michael Hafftka, Juliacks, Frank Santoro, Chris Cornwell, Rina Ayuyang, Sam Gaskin, and many more.